No real issues and pretty happy with my cavalier. It is very economical. It generally costs about $30 to $35 dollars to fill it from empty. I can go over a week one a tank of gas. It is a 5 speed and very easy to drive. It is only a 2 door but is very roomy in the back seat. The trunk is a very nice size so hauling bigger things is not to much of a problem. Now that it is getting colder out it heats up really quickly. My car has over 230k on it and it still runs very well with no mechanical issues. I really cannot think of anything negative about it that I do not like. I guess I would say my only complaint is the way the built the inside there really is not any storage areas and the cup holders are too close to the dash so only shorter cups will fit and they cannot be to big around. Otherwise I am pretty happy with it. The absolute perfect fit for me! I have owned my car for almost 3 years now. This car has been my absolute favorite it is small and comfortable but it can also fit 4 people comfortably. The trunk is pretty spacious I usually do not have to haul large things but if I am moving a lot of small things it works perfectly. Only issue I have had would be the check engine like tends to come on and stay on for days and no one has been able to give me a answer on why. Also sometimes when I get gas the car will take a try or two to start but always does but no one has been able to get me an answer on that as well. All in all this car has been my favorite and have had no serious issues with it. It is the perfect car for me! Chevrolet cavalier- small, unassuming, but lasts forever. When I purchased the car last year it had not been taken very good care of. The paint is in need of being redone but she drives like a dream. The cloth seats do not hold stains in or the smell of my dog, she's really easy to clean inside. I get better gas mileage than some of my friends with newer vehicles. Only complaint I have is that the window controls are in the center console instead of on the door, so whenever I drive another car I always reach for the center console to control the window. 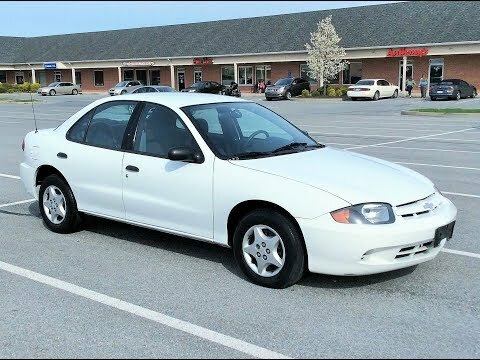 2003 Chevy Cavalier - Good Starter Car?